Congratulations to Year 12 music scholars Sarah Lawrence (violin) and Victoria Park (viola) who have both won places in the 2018 NZSO National Youth Orchestra. Since its inception in 1959, the National Youth Orchestra has played a vital role in providing unique opportunities for the country’s most gifted young orchestral performers aged 25 years and under, many of whom have gone on to forge successful careers both within New Zealand and internationally as orchestral players, soloists, chamber musicians and teachers. Approximately 50% of the current players in the NZSO are former members of the NZSO National Youth Orchestra. 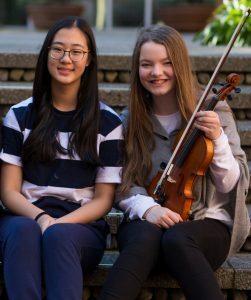 Sarah and Victoria will join other members of the orchestra during the last week of Term 2 for intensive rehearsals and concerts in Wellington and Auckland.